Pesto is one of the easiest sauces to make, as it requires no cooking, just a quick combining of fresh ingredients. This recipe makes enough pesto for dinner tonight plus 2 additional dishes (see related recipes at left). Storage tip: The pesto sauce can be stored in an airtight container in the refrigerator for up to 2 days or in the freezer for up to 2 months. Press a piece of plastic wrap on the surface of the pesto before storing to prevent discoloration. In the food processor , combine the basil,garlic,oil,pine nuts,salt,and pepper.Process until a coarse paste form.Transfer to a bowl and stir in the 1 1/2 cups cheese and the butter. Meanwhile, bring a large pot of water to a boil over high heat. Add the 2 Tbs. salt and the pasta to the boiling water. Cook, stirring occasionally to prevent sticking, until al dente, according to the package instructions. Drain, reserving about 1/2 cup of the cooking water. In a non stick pan, mix 2 Tbs. of the cooking water with 1 cup of the pesto. (Store the rest for another use; see note above.) 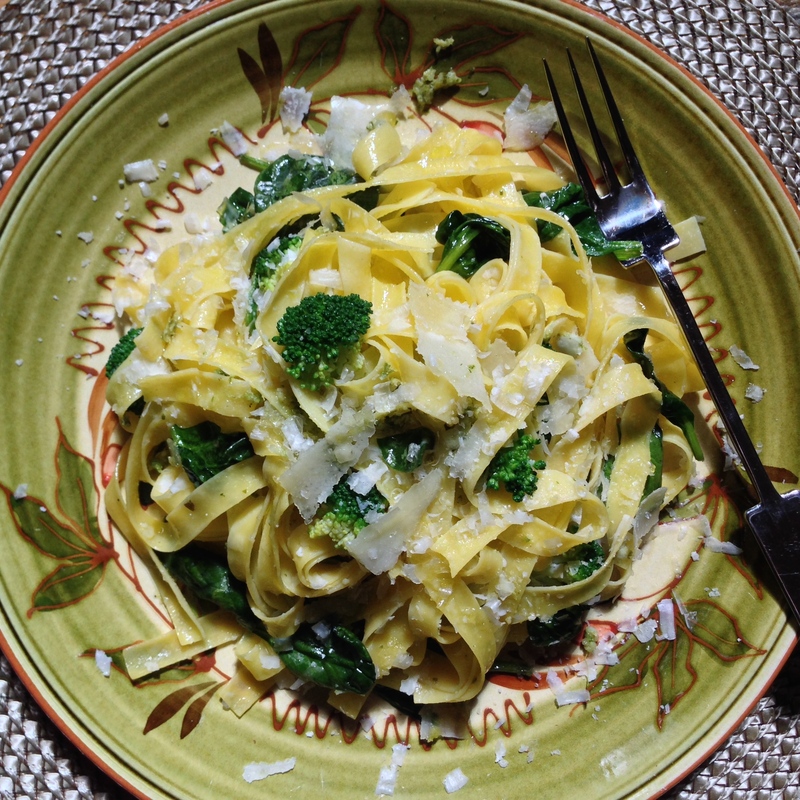 Add the drained pasta ,fresh baby spinach,broccoli ,parmesan and toss to combine. Add as much of the remaining cooking water as needed to loosen the sauce. Serve, passing the cheese at the table.